WOW! 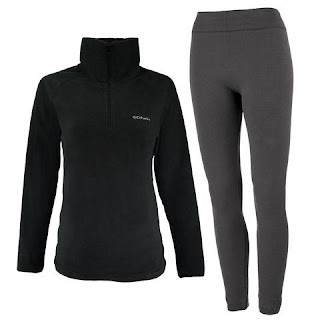 Check out these Columbia Women's Fleece Pullover and Leggings Set ONLY $19.99 (Retail $59.98). A pure, clean Columbia fleece jacket that's supremely layerable for cross-season versatility paired with True Rocks fleece lined leggings will keep you most comfortable and warm while adding style. The Glacial 1/2 Zip is outfitted with flattering princess seams and a roomy, high collar to keep out drafts. The True Rock Women's Fleece Lined Leggings have a smoothly brushed fleece lined interior that make them the softest and most comfortable leggings around. Designed to add warmth and style without bulkiness. Sizing is for the columbia fleece Pullover only as the leggings are one size only.